The 25-year-old mother of the former New England Patriots star’s daughter must make a difficult choice today. Shayanna Jenkins is not in an enviable position. 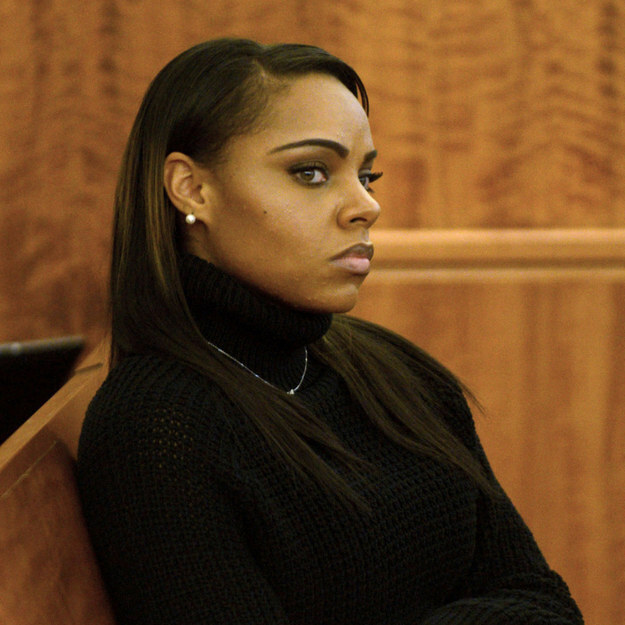 Jenkins, Aaron Hernandez’s 25-year-old fianceé and the mother of his daughter, is expected to be called to the witness stand Friday in his trial for the murder of Odin Lloyd. In February, she was from criminal charges in exchange for testifying against him. If she takes the stand and refuses to speak, she’ll be charged with contempt of court. However, prosecutors hope she will flip and testify against Hernandez, the father of her 2-year-old daughter, Avielle. In this murder trial — the first of two that Hernandez faces this year — Jenkins plays a central role. The victim, Odin Lloyd, was the boyfriend of Shayanna’s sister, Shaneah. Hernandez and Lloyd were introduced by the sisters, though Shaneah has testified that the men were little more than cordial acquaintances. Shayanna is positioned to choose between potentially betraying her sister or her fianceé, with whom she has a child. If she testifies against Hernandez, and tells the jury that he is guilty, he will have little left in his defense. If she does not, she will be held in contempt of court and jailed until the end of the trial, which would leave her child with both parents in jail. And if she does not testify against him and Hernandez is found not guilty, he still faces another trial for a 2012 double homicide, along with multiple charges of owning firearms without a permit. Also, jurors could still find Hernandez guilty on forensic evidence if she does not choose to testify. Jenkins has had a lot of scenarios to consider. If her attorney has advised her to take the risk of contempt, it’s possible she’s doubtful of the prosecutor’s case against Hernandez. Before the trial, the Bristol County sheriff said he would not allow Hernandez and Jenkins to marry. Even so, Massachusetts state law only awards spousal privilege for incidents that occurred after the date of marriage, not before. Prosecutors have spent two months building their case against Hernandez, and he’s caught few, if any breaks, with evidence against him. Experts have testified that a shoe print that was found near Odin Lloyd’s body match a pair of Air Jordans Hernandez was seen wearing the night of the homicide. A bullet casing found in the rental car Hernandez was driving the night of the homicide was recovered and matched to the other casings found at the scene. Surveillance video from Hernandez’s own home shows him walking around carrying a Glock the morning of Lloyd’s murder. Despite the arsenal of circumstantial evidence, prosecutors have yet to establish a potential motive, and the murder weapon was never recovered. Shayanna Jenkins could clear those loose ends up. Testimony so far has insinuated that she threw away the murder weapon — a Glock .45 — at Hernandez’s direction. Shayanna’s sister, Shaneah, and the Hernandez family housekeeper have both testified to seeing Shayanna leave the house with a large black trash bag with a box-shaped object in it the day after Lloyd’s murder. Shayanna borrowed her sister’s car, and told her she was going to the bank to get cash to pay the housekeeper, who later testified that she was paid with a check. Both witnesses have described Shayanna as being “anxious” that day. Attorneys for both sides have been arguing this week over whether or not to admit transcripts of phone conversations Hernandez made from prison, which are not privileged. He had multiple conversations about creating trust funds for the children of his terminally ill cousin, Tanya Singleton, who has been charged with accessory to murder and sentenced to home confinement for contempt of court. Prosecutors hope Jenkins will tell them Hernandez was paying off potential witnesses against him, but defense attorneys will make the claim that he was trying to support the children of a dying woman. Shayanna has not appeared in court for three weeks, but reports from the courtroom say she is present Friday, and wearing her engagement ring.